While my family was away last week I was lucky enough to have the Fiat, which first made an appearance on my blog here when I participated in a blog collaboration with the girls from ‘The Polished Edge.’ This is my dream car, I am obsessed with it; the colour (especially since it’s my favourite colour of this season as documented here), size and retro elements make it so perfect! 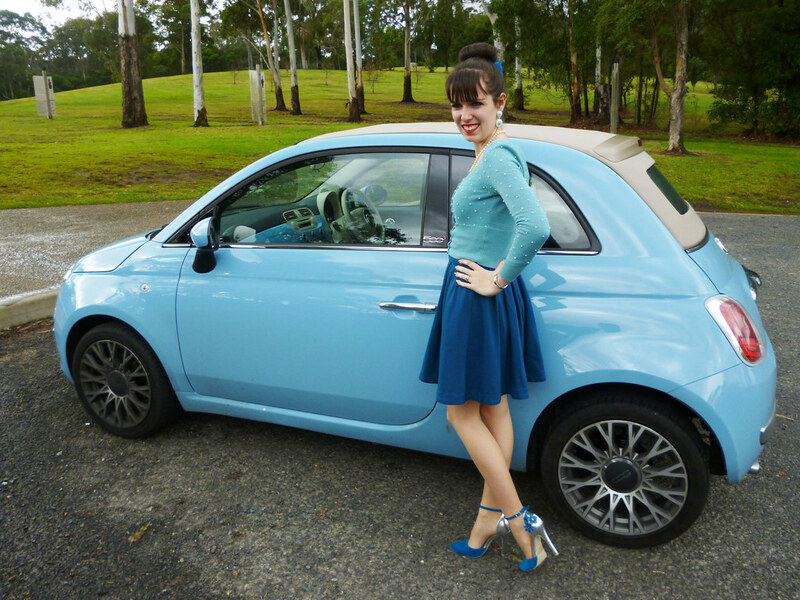 I simply couldn’t resist the opportunity to dress up in blue and take some pictures with the Fiat. It was great fun and it’s even more exciting to drive this car when I match it. This duck egg blue cardigan is certainly one of my most worn pieces this winter; I’ve also worn it here and here (it’s so versatile it even assisted me in looking like Snow White). In fact I seem to talk excessively about duck egg blue on my blog these days. There are so many different looks I can create with it but, for ages, monochrome is an idea I’ve wanted to try. I’m drawn to this style right now and I think it would be fun to try it in other colours too (although I’m not always going to have a cute car to pair with my look!). This skirt is an item I haven’t had too much wear out of in recent times. There’s no specific reason except that I sometimes forget about items I’ve had for a long time; anyone remember it from last year which I posted here? It’s great to rediscover pieces in my own wardrobe. I also like it because I don’t have many block coloured skirts and they are always so hard to find in the shops. Speaking of rediscovering items, this is the first time I’ve ever worn these earrings. I’ve had them for at least a year, forgetting until today that I even owned them. Isn’t it the best when this happens? I wish it occurred more often and I could find a cat print dress with a peter pan collar in my apartment (unfortunately I don’t like my chances on that happening!) As for the rest of my outfit, I’ve already written about so see my previous posts. 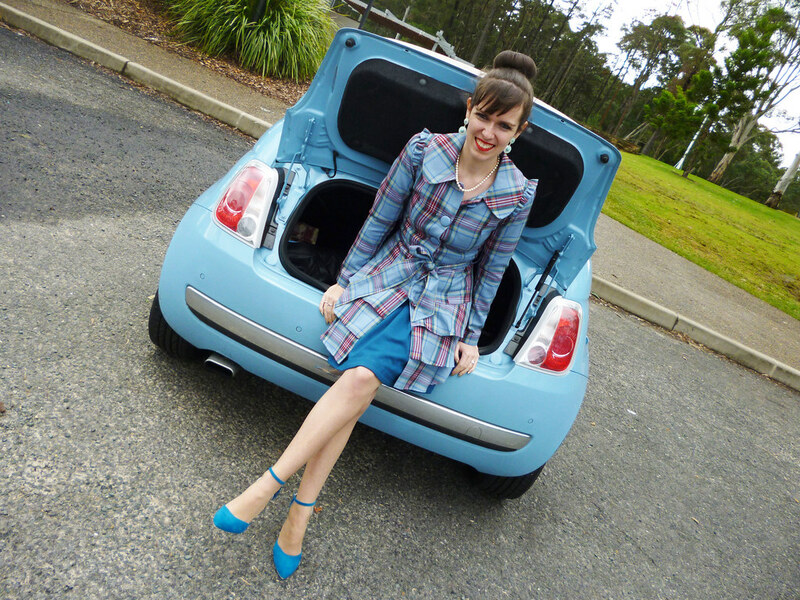 This entry was posted in Alannah Hill, Outfits, Portmans. Bookmark the permalink. such a cute car and look! 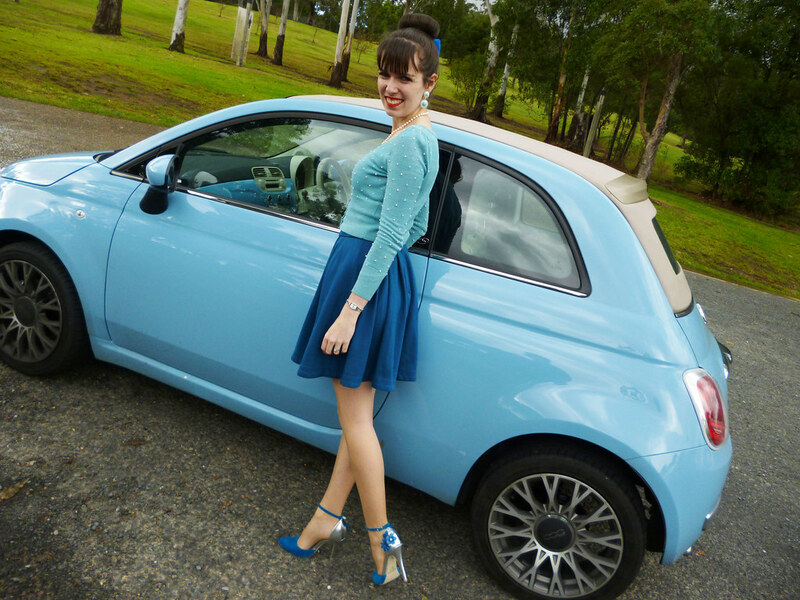 How cute that you match the Fiat! The perfect car and the perfect look! 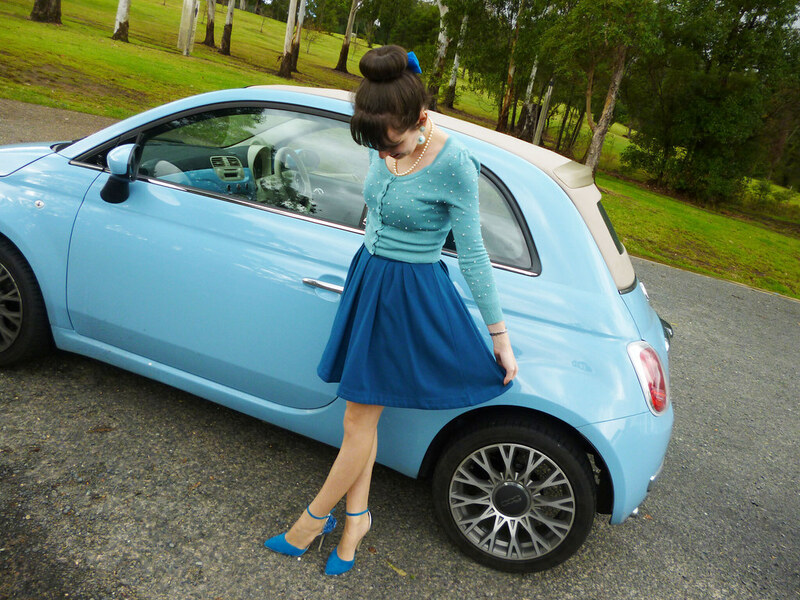 That cute little Fiat is amazing indeed, and I love how you paired your outfit with your car! The car is super cool! Love the color. Très fan de la petite Fiat ! Chouette !. thank you 🙂 i love the skirt! 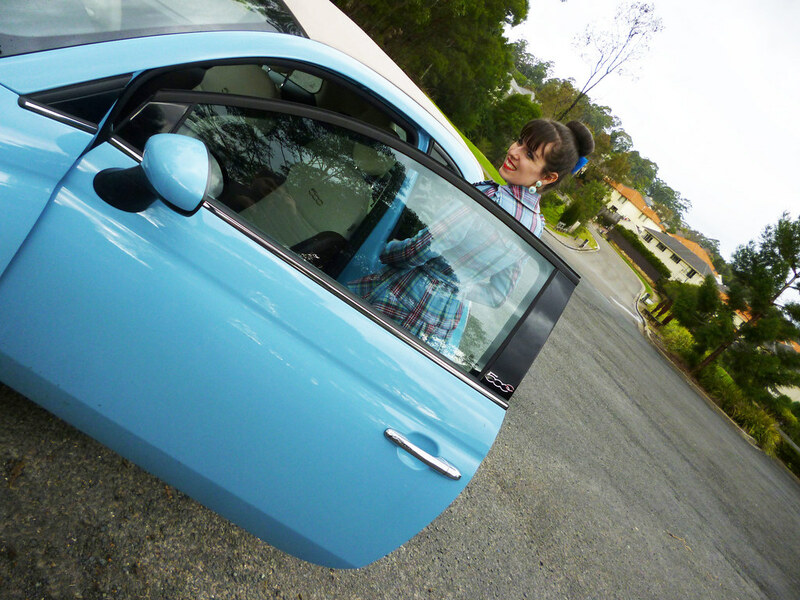 and the car is so cute! Cute car and you look cute as well. 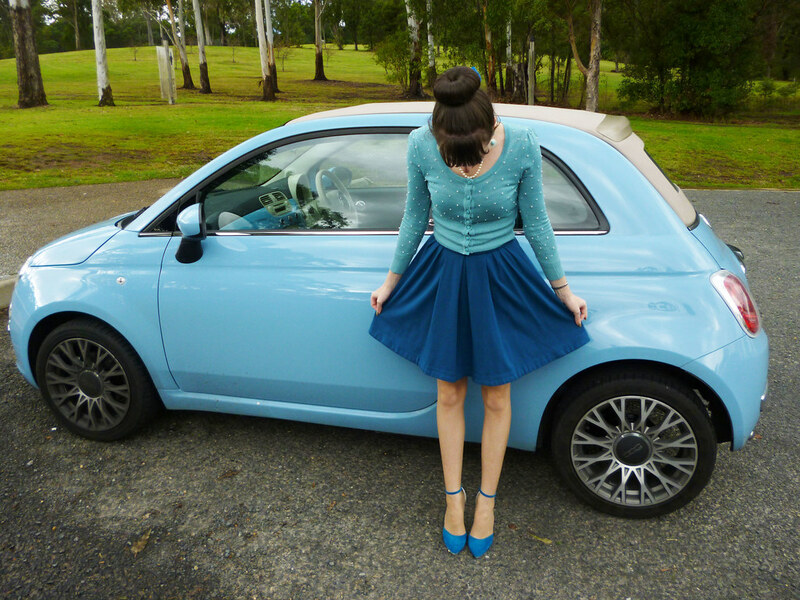 OMG cute outfit and car !! What a cute little car! I love that you dressed up to match it, and although I'm not normally a plaid girl, I have to say that I positively adore your blue plaid trench! You look so cute! I love your shoes and that jacket. the colour of that car is amazing! Gah! I want a Fiat SO bad!! Is it your parents? It's beautiful! So cute to pose with 🙂 I love these pics. I can't get enough of that cute sweater and those are some killer heels! oh you are always so perfect colourcoordinated! lovin your look! and yes i´m from austria;) where is your sister exactly? This outfit is super cute! and the shoes are just gorgeous..